If you’re looking for more precise measuring without the digital frills, add-ons and increased body size of the DST-64T, the DST30P is the perfect wheel balancer for your shop. It’s a cost-effective hybrid unit that offers the most precise readings you’ll ever generate from a wheel balancer. 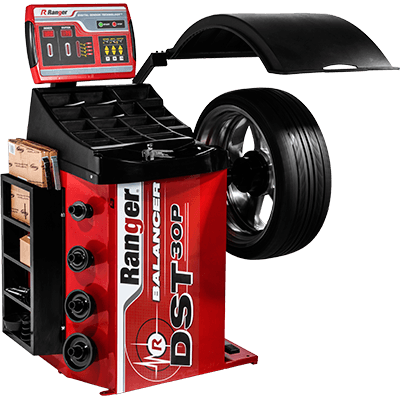 The DST30P wheel balancer tooling package includes car and light truck cones, as well as a heavy-duty truck cone and spacer ring. This package includes three “smaller” cones: 1.75” - 2.75”, 2.75” - 3.50” and 3.50” - 4.25”, as well as one truck cone 4.50” - 5.00”. Once an optional accessory, the 4.5" - 5.00" truck cone package is now standard. ​An even larger double-sided centering Truck Cone Kit that fits hub sizes 4.75" - 6.75" is sold separately, but also fits the DST30P.